Puma and Meek Mill are at it again with the fresh Patent Basket. 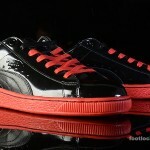 The shoe features and all black patent upper and pops of red on the laces and outsole. Check out more angles below and grab them in stores or online (10am EDT Release) tomorrow, March 21 for $ 100. See Launch Locator for stores. In collaboration with Meek Mill, PUMA launches the Dreamchasers Collection which includes two special editions of classic silhouettes. The two sneakers are the 24K Gold Suede Mid and the 24K White Gold Suede, with fresh materials and design while sporting the old-school look. The shiny kicks announce their presence with their metallic hues, which will be sure to turn heads. Available in stores Saturday. Check out Release Locator for stores. Black Friday is a time for all brands to bring their best heat of the year and PUMA doesn’t disappoint. 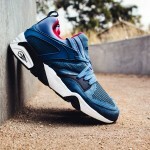 Hitting PUMA Lab Powered by Foot Locker stores on Friday is the PUMA Trinomic Blaze Pack. Accompanied by a corresponding PUMA Fleece collection, the Trinomic Blaze continues to push the aesthetic boundaries of lifestyle footwear that PUMA has become known for. As you can see in the image above, the Blaze will be dropping in three different colorways – all of which provide clean and styling on foot street looks. 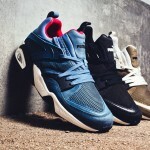 The three colorways of the PUMA Trinomic Blaze Pack release on Friday, November 28th at PUMA Lab Powered by Foot Locker and Footlocker.com. 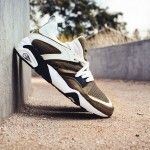 Check the Launch Locator to see which stores will have these releases. 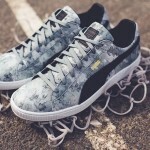 On Friday, August 22nd, PUMA will drop two classics redone in a new take on camouflage – Tree Camo. Tree Camo uses a range of grey shades to create an abstract textured camo pattern inspired by nature. 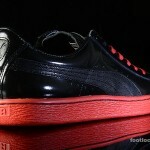 The new colorway is applied to the vinatge basketball PUMA classic Basket in its Hi and Low top forms. The branding on the shoe’s upper, tongue, and heel is done up in black leather for a distinctive feel against the Tree Camo backdrop. This pair of PUMA releases will be available at the two PUMA Lab stores in Atlanta and at our Herald Square location in New York City. The Basket Hi will retail for $ 90 while the Basket Low will cost $ 70. Over the weekend the eye popping PUMA Avanti Metallic Gold dropped at our PUMA Lab stores in Atlanta and in our Herald Square 34th Street location in New York City. 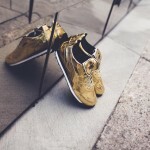 The Avanti is a soccer inspired street smart lifestyle shoe and this release, in particular, will have you feeling like gold. 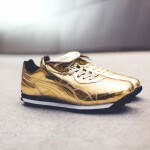 Wrapped completely in metallic gold, this Avanti release features a fold over tongue – much like a soccer cleat. 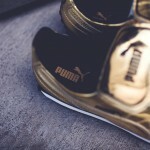 Black PUMA branding stands out against the gold upper that sits on top of a cushioned white midsole. 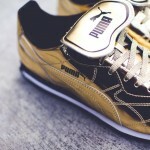 If you’re in the A or NYC, come check out our extensive PUMA selection and grab your golden Avantis for $ 125. 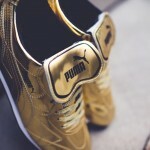 No one can argue that the PUMA Suede is one of the more classic shoes in the sneaker game. Clean and simple, the Suede can be work with anything and at any time of year. As such, the Suede is getting a makeover by co-founder of Peas & Carrots International, Anwar Carrots. Much like what the Suedes stand for, Anwar’s influence on the two brand new colorways that he collaborated with PUMA on are subtle and powerful. Both of the brand new drops have gum soles and include the Anwar Carrots’ logo on the sock liner, the tongue, and the heel. The two colorways are opposite of each other – one black and one grey with each featuring opposite orange and turquoise accents. You can pick up your pair of Anwar Carrots X PUMA Suedes at the PUMA Lab Powered by Foot Locker stores across the U.S. starting Wednesday, June 25th for $ 65. In the 90′s the PUMA XT2 stretched the bounds of technology in running shoes when it introduced the world to Trinomic technology – clear rubber cells along the upper that absorbed shock of running while being flexible enough to keep form and add cushioning and stability around the foot. 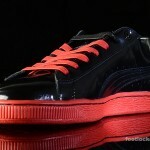 Now, PUMA has brought back the XT2 with updated and technology and eye catching colorways. Incorporating premium pigskin suede and modernized mesh into the silhouette the new PUMA XT2 Mesh Evolution II is now available at our 34th NYC location (rapper Future featured above recently appeared at the store to debut the shoe) and at the #PUMALab powered by Foot Locker our South Dekalb and Greenbriar Mall stores in Atlanta. The re-introduction of the XT2 includes a neon yellow and a neon orange colorway – both of which sit on grey speckled midsoles – which you can see below. The PUMA XT2 Mesh Evolution retails for $ 100. PUMA is back with two fresh colorways of their famed Blaze of Glory silhouette this weekend, and we’re excited to announce that they are coming exclusively to our #PUMALab stores in Atlanta! 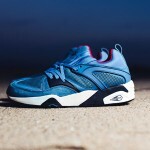 The PUMA Blaze of Glory Mesh Evolution Pack features two contrasting colorways, draped with mesh and suede materials, and adorned with colorful accents perfect for the spring. One colorway features an all-black upper, crafted with mesh and suede paneling with turquoise blue accents. The second colorway features an all-white mesh upper with stone-colored suede paneling and fuchsia pink accents on the sole, stitching and lining. The Blaze of Glory Mesh Evolution Pack will be available EXCLUSIVELY at the #PUMALab at our Foot Locker stores at the South Dekalb and Greenbriar Mall’s in Atlanta, GA this Saturday, April 19th. 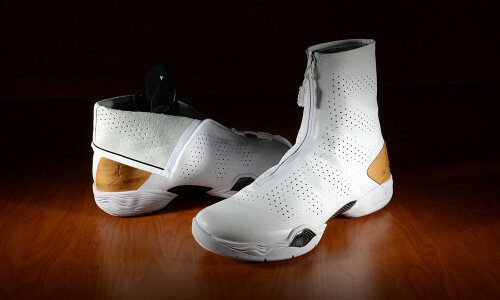 Each shoe will be sold separately and be available in limited quantities for $ 140 each. These releases will not be available on Footlocker.com. We are excited to announce a special partnership with PUMA this month creating a unique shopping experience in over 100 Foot Locker stores across the country. The PUMA Lab, Powered by Foot Locker showcases PUMA’s most premium footwear and apparel styles including limited-edition releases and exclusive products. The PUMA Lab is designed to be a destination for PUMA’s most advanced styles and each product is based on the four PUMA Lab elements of design, luxury, creativity and sport. Last week, in celebration of the PUMA Lab launch, Foot Locker and PUMA hosted an in-store party complete with special celebrity guests, including TI, Meek Mill and Young Thug, at the Foot Locker store in South Dekalb Mall in Decatur, Ga. The Puma Lab Powered by Foot Locker is complete with sleek branding, designer collaboration products, and PUMA designer information allowing customers to get to know the brand and its authentic sport heritage. Check out some pictures from the event below along with more info about the #PUMALab collection. Steeped in sport, unrestrained, and oh so premium. PUMA Lab archive products are refreshed with quality materials and fresh style twists. Just take the XT2 MMQ: once a running track-abiding citizen, now remixed with sophistication for the streets. This is the place where icons start and where they begin again. We look back to the styles of yesterday for inspiration to drive our creative vision and force us to experiment with wild, new style combinations. The result? Mash-ups of retro and modern such as the MMQ 50/50. Each season, Alexander McQueen’s craftsmanship and curiosity merge with PUMA’s sport heritage. Fashion-forward styles are made for lads and ladies who break all the rules, and luxury hits the streets with sought after silhouettes such as the Joust. True classics roll with the times and outlast the rest. Such is the Suede. A design that once rocked sport arenas from NYC to Tokyo, it has retired to stealing scenes from clubs to corners. Apparel – such as the MMQ Mesh Hoodie – are fresh complements to its smooth style. Ronnie Fieg presents his latest collaboration with PUMA, the Disc Blaze Lite “Coat of Arms.” Part of a 20-piece collection for men’s fashion week in Paris, London, the Disc Blaze Lite “CoA” features a salmon suede toe box, which nicely complements the premium black leather that dominates the rest of the upper. 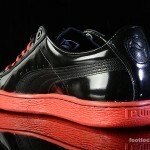 PUMA’s unique disc closure system also appears in black, as does the midsole, which also sports dark grey speckles. Check back with us for more information on this as we get closer to its release date.